The Char-Broil TRU Infrared is our pick for the best electric grill, which has a design that is perfect for balconies, patios and decks. It has a power of 1,500 watts, has a temperature that can reach up to 550 degrees F, is made with quality porcelain material and uses TRU infrared rays to cook food. Our step-up pick is the Weber 52020001 Q1400 and this one has an ergonomic shape that is compact and easy to put into any smaller spaced apartment or condo unit. It has a heating capacity of 1,500 watts for its power and a total of 189 square inches in the total cooking area. The budget pick is the George Foreman 15-Serving and this one has a total cooking area of 240 square inches, which is pretty large. It is made with nonstick coating for ease of cleaning up and it can give you up to 15 servings or more in just one go due to its large size. Nothing beats the joy of grilling outdoors. Grilling outdoors is always a mood setter when it comes down to cooking food and hosting parties. When you cook your food outdoors, it brings together families, children and everyone. Cooking anything in a more traditional way brings up old people as well – with their ways of making sure that the food is done properly and teaching it to their grandkids. This is why roasting or cooking food in an open fire instead of in a range is sometimes better. However, not everyone has an outdoor space, such as those in apartments, which make grilling hard. Outdoor spaces can be a luxury for some people because they only live in such places. Therefore, grilling is not always a thing that they can do. Not everyone can have roasting ovens as well in their space, and also prefer the good thrill of cooking in a grill (hey, that rhymes!). This is why you need a grill well-made for indoor spaces. An option to look into when it comes down to grilling would be electric grills. 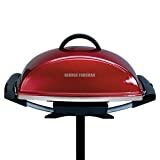 These electric grills are capable of being used indoors without a lot of hassle, as compared to units that are only supposed to be used outdoors. They are usually safer, more economical in the long run and are more ideal for apartment goers. As opposed to charcoal powered ones and gas powered ones, these run purely on electricity in order to cook your food items. Most people agree that such electric grills are also eco-friendly due to not having to use charcoal. The problem with using charcoal is that it can contribute to carbon deposits in the air, which can end up in the ozone layer, creating more room for global warming to take place. Carbon deposits should be lowered nowadays to help our environment, and so by switching to electric grills, you become more responsible with the environment when you cook your food. Most people look for grill marks in hamburger patties. With that said, some people still prefer the taste of charcoal-grilled food items, such as burger patties. This is because a certain taste is emitted with the burning of the charcoal and wood, as compared to electric heat. If you can somehow lessen the amount of charcoal when you cook, it is still okay to cook in this manner sometimes, so that you can have the juiciness of charcoal-grilled burger patties, chicken and the like. However, one great thing about these electric grills is that they can potentially produce less grease. If you previously had problems with keeping the grease to a minimum when it comes down to using the gas or the charcoal grill, it will be less of a problem with the electric powered one. Grease can potentially cause weight problems due to the presence of bad cholesterol in your food so it is a good idea to keep it to a minimum. Electric grills are not just limited indoors – some are designed specifically for outdoor use, and even have wheels. If your unit has a stand and has wheels, you can definitely take it with you outdoors for a party or a barbecue event. There are also instances in which the design has two trays on both sides – perfect for cooking items or preparing them on the go without having to bring out another table or platform for you to prepare on. Wattage: this is the most important thing in an electric grill. The wattage serves as a guide for you to know how much electricity you will be consuming on a regular basis with using this unit. The wattage should be in the right levels so that it will not totally consume a lot in the long run, and should also have eco-friendly features to help you save your electric bill later on, especially if you cook a lot. Safety features: you have to consider one that is safe in all of its features. For instance, it should have an automatic shut off feature when it is not in use, or when the unit is too hot, it should have a feature for it to easily cool down. There should also be cool to touch handles so that when you are handling food items, you will not be at risk for burning your hands or parts of your body. Size and cooking area: the size of the cooking area is important so that you can be able to fit more items in there, especially if you are cooking for a large family or many guess. The cooking area can also make a difference in terms of saving time and effort to cook large batches of food. If you want to get more job done then you should definitely consider a larger sized cooking area to roast your food. Style and design: when it comes down to choosing the appropriate design for your cooking unit, it pays to pick the right one. The design can sometimes be smooth in some of the units, while others are made for a more compact design. It should have a good design in terms of the lid and the container so that it will also be safe to use and to look aesthetically pleasing for guests. Ease of cleaning: you also have to consider if the unit is a lot easier to clean overall. A grease tray would be useful when it comes down to cleaning the unit and at the same time, keeping the grease at bay. You should also have a unit that has a smooth surface for easy wiping and easy cleaning. Grease catching: like we mentioned above, grease catching is important so that the food that you cook will not have too much grease and fats on it. This is important for a healthier lifestyle when you are roasting your food in a powered unit. Additional features: things like additional trays on the side, wheels at the bottom or a nice stand for an outdoor barbecue affair could be of great use overall. As our top pick, the Char-Broil TRU Infrared has a heating power of up to 1,500 watts, which makes it quite powerful. There are also some easy instructions on how to assemble it, so it is quite user-friendly for those who do not have the idea of setting up an electric grill. As for the total size, it has a 245 sq. in. cooking area so it is quite large as a cooking unit for both indoor and outdoor use. When it comes down to the technology that has been used, it uses TRU-infrared to heat up food so it can be very fast and can go for up to 500 degrees Fahrenheit in about 10-12 minutes, making it more efficient to cook with as compared to other power outlet cooking units. It is also made with a porcelain grilling grate so that it is quite durable to last for a very long time. When it comes down to preparing your food items, it is almost as good as gas in terms of cooking vegetables, meat and the like. For those who do not want to deal with charcoal, this is a good alternative for your patio, balcony or deck. It is also going to fit well if you live in an apartment building. The only con but not a deal breaker with the Char-Broil TRU Infrared would be the ceramic coating, which can chip off a bit, but will not really affect the cooking if you cook with it properly. Our step-up pick is the Weber 52020001 Q1400, which has an electric heating element of 1,560 watts, which means it packs a significant amount of power as a heating unit for cooking items both indoors and outdoors. It has a cool design that is not too spacious, making it ideal even if you do have a balcony or patio in your house. It has a cooking area of 189 square-inch, which can be more than enough for many veggies and meat. It can be used for most birthday parties due to the great design. Setting up is easy because the item has already been assembled out of box. You can easily pick out your items, such as chicken from the freezer, and roast them in the unit without a lot of effort as gas and charcoal heating units do. It even has an extra shelf for other food items, so that you can become more organized in your cooking process. The grates are made of porcelain-enameled cast-iron so it is very durable overall. Its nylon frame is made with glass for its construction so that it not only looks stylish, but also adds a decent durability to it, while the system is almost as good as gas. The burner valve settings have an infinite control for making your custom recipes more temperature-precise. As a strong unit, it holds a stable temperature even within minutes of opening the lid so that your food will remain cooked in the right temperature all throughout your cooking process. Also, removing and storing the controller is easy so you can clean it up in a breeze. It also comes with a 6-foot grounded cord so even if it’s far from your power source, you’ll definitely find it easy to power up. 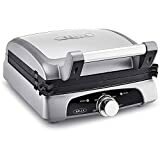 Our budget pick is the George Foreman 15-Serving has a total of 240 square inches in its cooking area, so it is quite wide for you to cook on and will allow you to cook more items in one go. It is also quite easy to clean due to the design, making it less of a hassle for you to prepare your food items and at the same time, stay safe. It has a sloped grilling surface to remove fats and grease so that your food items will be much healthier when they are cooked. There are a total of five heat settings in the unit so that you can customize your cooking preferences. It has no likelihood of flare-ups because of the safety features of the unit. As a fully electric system, it will be ideal for those who are staying at apartments, condo units and smaller places. To make it much easier to clean up, it has nonstick coating on its outer and inner design. There is also a removable stand in case you want to store it when not in use, or use it in a smaller space. It can give you up to 15 servings in one go and it has a dishwasher-safe drip tray for catching grease. If you want to make some barbecues for dinner or for lunch, the Livart LV-982 Electric can be a great choice for you. It allows you to make anything in yakitori-style cooking due to its unique design, which is simple to use with the user instructions that are available. Because of the fact that the grill rack is in 1/2″ squares, food bits will not get into the bottom of the pan too easily. It also has an adjustable grill height so that you can adjust accordingly depending on your food recipes and cooking style and place. Its detachable stainless steel grill can potentially last for a long time, and because it can be detached, it is easier to clean the unit overall. It has a bottom tray which catches fat so that your food items will not be too greasy. As for power, the output of the unit is at 1,450 watts. You can make it ideal for most Asian recipes, such as those with veggies or smaller slices of meat like lamb chops. If you want a unit that has removable plates, the Bella 8-In-1 NonStick can come in handy because its design allows food to cook up quickly – which is perfect for parties where you need to serve the guests right away. For your reference, it even has a chart that shows the temperature for your foods that are needed depending on the type of food you have. Its removable plates are its biggest advantage, which makes cleaning easier and most of its parts go straight into the dishwasher. The temperature control is a great plus because it allows you to set the right cooking temperature without ruining your food items and recipe altogether. Its adjustable heat can come in handy in many food items like burgers and veggie recipes. Because it is non-stick, it is a lot easier to clean regardless of food items that you have, such as meats, fish, veggies, sandwiches and many others. You can even make Panini and pancakes out of this unit and make your favorite veggie recipe right off the bat. Its plate seasoning is pretty okay so you only need to maintain it a bit. There are also 2 small grease containers for keeping the fat away as much as possible from your food. The 9.5 inches square waffle plates assure you that less food will fall off into the bottom. If you want to go camping but also want a place to cook your meals, the Giantex 1350W BBQ can be a good choice for you. 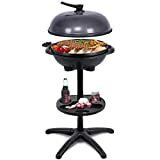 It is pretty big in its cooking area, with over 240 square inches on its grill plate – perfect for a lot of barbecues and camping food recipes to enjoy with. You also get a total of 4 settings to adjust for its included variable temperature controller, which means that you can fine tune your cooking depending on what is given by the recipe. Bearing up to 1,350 watts of power, this cooking companion is made of durable aluminum plate and ABS plastic, which makes the unit ideal even for the worst weather. 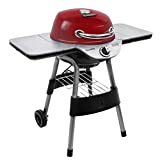 This electric unit is capable of handling different food items due to the various features, such as the 360 rotatable condiment tray, making barbecue time a breeze when it comes down to seasoning and the like. It has a removable bowl for grease catching so that your food items will be fat-free or at least with less fat. The removable stand can also help you to use it even indoors or in cramped space areas for cooking. If you want an electric unit that works both indoors and outdoors, a great unit to consider would be the CHEFJOY 1350W Indoor/Outdoor. It is easy to assemble it together due to the simplicity of its design, and it has over 240 square inches of cooking area, which can be crucial for those who have larger families, are maintaining a business, or just like to cook in bigger batches. To help you prepare your meals easily, it even has a condiment tray. Being an easy to clean up unit due to the simple design, it has a variable temperature controller to let you control the temperature much easily depending on your food or recipe. It has 1,350 watts of power so it is pretty good in terms of consumption. The removable temperature indicator and regulator can also aid you in preparing your favorite dishes. Most who tried this electric unit said that it cooks meat pretty well. It has a durable metal grill hood and plate that has been designed so that it can last for a few more years. It also comes with a stand and base that are needed in the setup for you to use it both indoors and outdoors. Having a fast heat-up time makes it ideal for sudden parties in your house or neighborhood. Having a non-stick coating means that it is easier to clean, and the grease collecting bowl helps it to keep fats away from your food items. If you want a unit that is ideal for all seasons, the Kenyon B770400 Texan would be a good choice. It is UL approved to be okay for both indoor and outdoor parties, making your life easier if you are a frequent camper. It can heat up quickly within 10 minutes, reaching up to 600 degrees Fahrenheit. It also has a precise heat control panel that is waterproof, which is important when cooking in drizzles. The heating elements in this electric unit are at 1,500 watts of power and there are two in the set for faster cooking. The corrosion-resistant design of the stainless steel construction can make it more durable than other brands out there. Because of its split lid design, you can be able to prepare foods much faster or let them rest for a while after cooking. For large parties, tailgating and camping with many people, a good electric unit to consider would be the George Foreman GFO201R. it has the capability to fill up to 12 servings in one go due to the cooking area of 200 square inches. Because it has a grease removing slope, your food items will have less likelihood of fats on them. It has nonstick coating for making it easier for you to clean and store later on when no longer in use. It has a removable stand so that you can use it wherever and whenever, especially in smaller, indoor spaces, or even on your patio or camping grounds. For those with a penchant for hamburgers, the Char-Broil Bistro 240 can be a good choice for you. It has a good grilling surface of 240 square inches, with extra warming racks on the side, amounting to 80 square inches in total. It has corrosion-resistant cooking grates that can help you cook your food in the safest way possible. It has a grease tray to catch all of the fats and keep them away from your food. The temperature control knob, as an important aspect of this cooking unit, can make your life easier in terms of specific heating instructions as said in your respective food recipes. 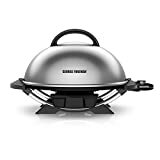 Other electric grills were not satisfying and were not in our list because they were poor in terms of design and often leaked out and spilled grease everywhere. Also, most of them did not have sufficient safety features, which is important in any kitchen or cooking appliance. Q: What features of an electric grill are the factors that decide whether they are better than the rest or not? Ease of cleaning We all know that cleaning anything is a tasking job, especially when it comes down to kitchen items. Therefore, it pays to have a cooking unit that is easy to clean overall. Side trays The side trays can also be called as condiment trays, which can be used in order for you to put your other ingredients, food items, seasonings and the like while you are cooking your barbecue, kebab, burgers, marshmallows, yakitori and the like. Drip tray for grease If your electric unit has a drip tray then that will be good for your health. A grease tray can potentially keep out most of the fats that come with the food as you cook it, allowing for less fats and less guilt when you consume your food items or recipes, such as meat. Corrosion-resistant For those who really want a longer-lasting electric unit, you should pick one that has corrosion-resistant properties. The stainless steel should be of quality grade at the very least. Fast cooking time Many people are turned off by the fact that most electric heating items for cooking can heat slowly as compared to gas and propane. This is why you need one that can heat up as fast as needed to make sure that you save time and effort in the long run. No cold spots Having no cold spots in the electric unit means that you can maximize the space that is available in your unit’s cooking area, making your cooking time more efficient as you go. Dishwasher-safe parts You definitely need something that can easily go into the dishwasher, especially if you have a large family and have a dishwasher to maintain most of your kitchen tools and utensils. Q: Why is it important to clean your electric cooking unit? A: If you don’t clean your cooking unit properly after using outdoors, it can potentially form grease, which can be a source of accidental flare-ups, which, in turn, can cause injuries. Having a clean unit means that your safety is pretty much secured in the process, so make sure you clean your unit regularly. Q: What are the basic steps in preparing smoked ribs? Mix the ingredients that are needed for a rib rub, such as pepper, salt, paprika, brown sugar and whatever is indicated in your recipe. Process the meat by trimming extra fat and taking out the membrane, to ensure that it is ready to be cooked. Use the rub you made earlier, along with mustard, to cover the whole meat or ribs that you have just processed. Get the ribs into your cooking unit and let it smoke for about 3 hours or so, depending on what is indicated in your recipe or the type of fuel of the unit that you’re cooking on. Create your mop sauce using apple cider vinegar and beef broth, and then pour it over your ribs as it smokes in the cooking unit. Put the meat side of the ribs down in an aluminum foil, and then cover the top with butter, brown sugar and honey. Cook the wrapped ribs within about 1 to 2 hours depending on its doneness. Uncover the ribs after cooking it and then coat it with your preferred barbecue sauce. Put back your ribs in the cooking unit to a heat of up to 300 degrees Fahrenheit. Let it heat up for at least half an hour. Let the ribs rest for 10 to 15 minutes before you serve it in a better temperature. Q: What is the importance of proper clothing when cooking outdoors? A: If you cook outdoors (or even indoors), you should definitely dress up properly. Most clothing items can catch fire during sudden flare-ups, and can bring you trouble and accidents when you least expect them. Make sure that you are geared up with the right clothing to prevent such unfortunate events from happening. Q: Where should I keep the cooking unit away from? Q: What are some common mistakes when it comes down to outdoor barbecues and hamburger parties? Grill lid is not tightly sealed When your lid is not in the right sealing position, it might leak out the temperature and will not cook up the food properly. This is because the temperature will become uneven in the process. Checking the fuel Whether you have a gas, propane, charcoal or electric powered one, you need to consider checking the fuel source to see if it is safely functioning. Poor time management There can be times when you make recipes in the wrong timing, so there are food items that get inevitably cold because you have left them behind due to poor time management. You have to know which recipes take the longest and maximize your time with the shorter ones. Improper placement of food items When you crowd a certain cooking unit with a lot of food items on top, it becomes less efficient when it comes down to its cooking power. This is why you need proper spacing, and don’t cook more than what your unit can cook to avoid heat loss and lengthening the cooking time. Avoid cold and hot spots You need to check your cooking unit for hot and cold spots in an electric unit to make sure that all of your items cook more efficiently. There are many tests on YouTube that allow you to do so, and if you do find that it is uneven, it may be time to get a new cooking unit. Q: What is so great about grilled burgers? Q: How are skillets different from grills? Purpose The purpose of this cooking item is to hold food items and heat it up using a separate fuel source. It does not have its own fuel source, except ones that are electric. It has its own fuel source and is used for heating up any food item or recipe. Electric units use electricity as fuel. Wattage Electric skillets can be up to 700 watts of power in each unit. The average wattage for this electric unit can be about 1,500 watts of power, depending on the size of the unit. Coating They can be coated with nonstick coating. They can also be coated with nonstick coating. Washing and maintenance Cleaning them is usually done by hand to avoid removing the nonstick coating. Some parts are safe to be cleaned in a dishwasher, except for the ones that have a nonstick coating on top. Typical foods that are prepared Skillets are best for flat items such as pancakes. It can also prepare breakfast items like sausages, hotdogs and the like. If it has an enclosed design, you can also cook stews. 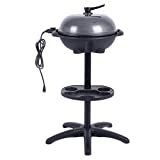 This unit is perhaps the best for hamburgers, steaks, meat recipes, smoked ribs, barbecues, kebabs and the like. Size of cooking area The size is usually smaller because it is just one unit. It is usually a larger unit that can fit more items or patties in one go. Q: What are the benefits of grilling your food? This cooking method has many benefits. Q: Why do traditional people still cook outdoors using charcoal? Despite global warming concerns, some people still cook with charcoal as fuel. Charcoal gives off a unique and juicy taste that cannot be always tasted in food items that are cooked in gas, propane or electricity. Charcoal is usually a more common resource or fuel for cooking, and the cooking unit is always cheaper in this case. Therefore, many old folks will find it more economical. Many will argue that charcoal cooking brings the true spirit of camping or outdoor nature tripping, especially if they have kids who enjoy barbecue parties and marshmallow toasts. Q: What are the different kinds of materials that can make up this kind of cooking unit? Stainless steel This is the most common material that you will find for these units. They will be resistant to corrosion and will look good in terms of finish, leaving less need for maintenance. They can be pricey, however, and the heat might not retain for too long when cooking. Cast iron Cast iron is another popular material, and is a bit cheaper. They are naturally nonstick as compared to stainless steel, which puts them at an advantage for cleaning. However, they can be prone to corrosion even more than stainless steel is. Aluminum There are also cheaper ones that are made with aluminum parts, which can help if you are going on a camping trip and need to carry something lighter. However, it is not as durable as stainless steel or cast iron. Q: Is it legal to put a grill on my pontoon? Know the rules in your locality about pontoon grills. Pick the right fuel for the job that will not be a fire hazard. Ensure that the unit you have will have safety features. Always have someone watch over the cooking unit. Q: Why is it important to buy an eco-friendly kitchen appliance? A: Anything that you use for cooking can consume a lot of power on your next bill (or even gas and water in some appliances). Therefore, you should consider a eco-friendlier kitchen appliance by looking at energy stickers, asking the salespersons, comparing the wattages and doing research about the product you a looking for. Q: How are smokers different from grills? Smokers cook at a slower and lower temperature than grills. Indirect heat is used by smokers instead of direct heat. Smokers look bigger in terms of design and space. Smokers are more ideal for food preservation. Large meat cuts that may not be ideal for grilling fit well on smokers. Q: What are the health benefits of kebab? Kebabs are some of the most common skewer recipes. Q: Are there benefits to consuming barbecue? Barbecues are often cooked outdoors. Protein Protein is found in most meat and can help you with workouts and staying fit. Vitamin E and B6 These two proteins are found in Worcestershire sauce, which can help you to avoid sickness easily. Some of them are also found in vegetables used in kebabs. Q: What are some common foods to grill? There are many things you can cook outdoors. Q: What other foods can I grill other than barbecue? Veggies like the asparagus can be grilled. Q: What is BTU and why is it important? Higher BTUs can help cook your meat faster. A: BTU is the abbreviation of British Thermal Unit. It is the measurement of heat that is burned per hour, and usually refers to anything that is related to fuel measurement. It is not applicable to cooking units that use electricity, but it does measure those that use gas or propane as fuel. Q: Which parts of a grill can be dishwasher-safe? A: The two most important parts that can be dishwasher-safe include the grease catcher and the grill itself. It depends on what is indicated by the manufacturer as to which parts of the unit are safe to be cleaned in the dishwasher, so you should definitely consider reading the manual first. As a whole, we think that the Char-Broil TRU Infrared is our pick for the best electric grill, due to the power of 1,500 watts, max temperature of up to 550 degrees F, ideal design for balconies, patios and decks and its technology that uses TRU infrared rays. These features are awesome and will make your outdoor and indoor cooking experience very exciting.